Album, Trying To Figure It Out, she’s not looking to be like anyone else. “Got my own thing,” she sings over the song’s urban, trance-like groove. Although the singer and saxophone player has been acclaimed by critics and audiences alike as a jazz musician, the track’s exhilarating chorus, haunting keyboard hook and brittle electro edge show an artist interested only in playing what she loves labels be damned. While a current Kelly concert might delight jazz purists with Great American Songbook standards, it could just as easily inspire mainstream listeners with Gracei-fied takes on the likes of Daft Punk’s Get Lucky, Coldplay’s Magic or Sia’s Chandelier. But whatever the style, the 23-year-old seven-time winner of the Downbeat critics poll (as a rising star in the alto sax category) spices up the sound with the lyrical and soulful phrasing of her instrument. Kelly, who guested with the Jazz at Lincoln Centre Orchestra as part of the events surrounding Barack Obama’s inauguration celebration at the request of the ensemble’s director, Wynton Marsalis - remains as committed to superior playing as ever. Kelly says she has been well served by applying those same jazz concepts to the personal demands of everyday life. “I really take the concept of improvisation and spontaneity in the music, and I live it,” she said. Drawn to jazz by melodic players like Stan Getz and Paul Desmond, Kelly also found in the music a freedom to express herself that she had not found in her classical piano lessons. 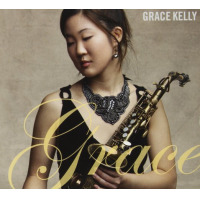 Née Grace Chung in Wellesley, Mass., in 1992, Kelly started taking clarinet lessons in Grade 4 but quickly switched to alto sax at the age of 10. She was soon transcribing Miles Davis pieces. Kelly recorded her first album, Dreaming, when she was 12. Even on that debut release, the music pointed to her future eclecticism by mixing the pure pop of On My Way Home with selections like the Beatles’ Can’t Buy Me Love, a medley of Blue Skies and In Walked Bud and the self composed odd-meter jazz instrumental G-Bop. Times Too (2005) was an ambitious double disc that mostly paid homage to jazz standards on its first half and explored classic Beatles and Stevie Wonder, along with some innocent and catchy originals, on its second. Every Road I Walked (2006) followed, further refining Kelly’s ability to blend genres. Self-penned tracks like Filosophical Flying Fish, with its second-line groove, and the easily accessible charmer Finish Line sounded quite at home with a sweet and sensitive reading of Somewhere Over the Rainbow, a winning excursion into bossa nova with Samba de Verao and a lightly funky Summertime. Kelly, 14 at the time of the album’s release, received the first of her ASCAP Foundation awards for the title track and was invited to perform with the Boston Pops. For the occasion, she wrote her first full orchestral arrangement, adapting the award winning piece. Lee Konitz, the influential composer and alto sax player, who had been Kelly’s teacher and mentor since she was 13, became her collaborator on the 2008 release GRACEfulLEE, which featured the two stretching out with a stellar band made up of guitarist Russell Malone, bassist Rufus Reid and drummer Matt Wilson. An almost 10minute take on Konitz’s Thingin’, the stately, jointly-composed title track and taut, unaccompanied improvised miniatures like Alone Together and Buzzing Around were among the highlights. The album was a critical triumph as well, drawing a 4-and-½-star review in the jazz bible Downbeat, an endorsement that later earned it a spot in the magazine’s Best Albums of the 2000s issue. “Her duet with Malone on Just Friends is stunning in its simplicity and feeling how can a teenager communicate this depth of expression?,” the publication’s Michael Jackson wrote in his appraisal. Mood Changes, released in 2009, found Kelly playing tenor, alto and soprano sax on her most Self-assured work to that point. The bouncy, swinging Happy Theme Song set a celebratory, searching tone best showcased in smart, inventive arrangements of Comes Love, Ain’t No Sunshine and I Want To Be Happy. 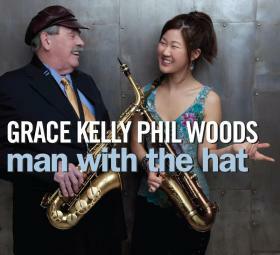 A second auspicious studio collaboration followed when another alto sax legend, Phil Woods, 80 at the time, teamed up with Kelly, then 18, for The Man With the Hat (2011), which also brought a tour to promote the album. Master and protegée traded ideas on four of the disc’s seven performances, including the swinging title track and a stunning reading of Billy Strayhorn’s Ballad For Very Sad and Very Tired Lotus Eaters. Kelly added to her musical pallette later that year by releasing the reflective jazz-gospel set Grace, most of which featured her and inspirational jazz pianist George Russell Jr. putting their own stamp on traditional spirituals, without further accompaniment. 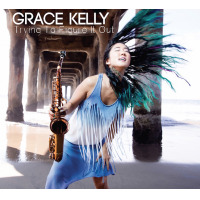 Among the few exceptions, Kelly’s melodic overdubbed solo piece Grace Alone and a joyous, infectious Let There Be Peace on Earth with percussionist Jamey Haddad from Paul Simon’s band were every bit as satisfying. By then, the music sounded as if it were coming from a deeper place. Kelly also graduated from the Berklee College of Music in 2011, with a degree in professional music. She has taught residency workshops there since 2012. That year also brought another important opportunity to pass on her musical knowledge: the U.S. State Department sent her on an international speakers tour to be an ambassador of jazz and educate the people of Madagascar and the Comoros Islands about the music. The dynamic 2013 Live at Scullers disc offered a country-flavoured original, Kiss Away Your Tears, among other self-penned performances and a couple of jazz standards. 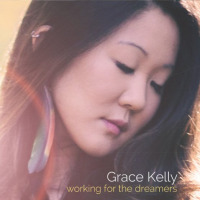 The 2014 EP Working For the Dreamers featured gems like the urban, soft R&B of Touched By An Angel and the pulsating electro beat of Cold Cold Water, keeping the momentum of change in the foreground of Kelly’s creative agenda. Trying To Figure It Out, due in February 2016, finds Kelly once again following her restless artistic spirit. The new work explores, in her words, “the world of jazz and beyond.” Fittingly, the album’s musical setting shifts from acoustic, conventional jazz (as typified by her touching version of Somewhere Over the Rainbow, a live favourite) to a genre-bending approach, with more contemporary production values. Blues For Harry Bosch perfectly illustrates the concept, appearing in two versions - as a retro-jazz piece with a film nour-ish feel and as a thoroughly contemporary remix with a clubby trance groove. The track was written for the Emmy-nominated Amazon Prime series Bosch, in which Kelly will appear when the jazz-loving title character, an L.A. homicide detective, stops into Catalina’s Jazz Club in Hollywood to see her perform during the show’s second season. Link to Workshop Brochure http://www.gracekellymusic.com/assets/teaching/GraceKellyWorkshopsBrochure1 0.pdf Grace Kelly Workshop/Clinic/Master Class Series WS-1 - Improvisation In this workshop we explore different aspects of improvisation. I'll be teaching my concepts to the students along with hands on exercises during our time together. Many of the techniques/concepts will be explored to the depth that is appropriate for the level of musicianship of the class I am teaching. WS-2 - Connecting the melodies in your head to your instrument One of the hardest things about improvisation is translating the ideas you have in your head (melodies, rhythms, chord changes, notes) and simultaneously playing it on your instrument. Improvisation shouldn't just be about theory. It's not just about moving your fingers. Improvisation is about the musical ideas in your head (along with the theory you've learned) and spontaneous interactions with the band. Overtime I have learned how to translate the music I'm hearing in my head to my fingers. It's a slow process that involves practicing ear training, and singing out your ideas THEN finding the notes on your horn (or whatever instrument you play.) I've done a lot of workshops where I present my own ear training exercises to musicians I'm working with and they are very surprised how simple they are and yet very challenging at the same time. It's amazing how a whole new musical world opens up when you can truly PLAY what you are HEARING. Playing/singing melodic phrases and voice leading are key musical elements that are like the "connective tissue" for me when I'm improvising. WS-3 - Creating "Magical Musical Moments" with your band How do we create that "spark," that indescribable moment when you and your band are truly locked in? It almost feels as if you’re reading each other’s mind, it’s a type of synchronicity that feels higher than high. Improvisation is all about spontaneity and listening it's also about telling a story. We'll dive into exercises that make you and your combo sound much tighter as a BAND. We'll work on exercises that show you how to shape your solo, work dynamics into your song/improvisation and interact with your band members on a deep level. It doesn't matter what "level" you are. I can improvise with my band on one note and get some fire behind it. This is one of the biggest lessons I learned from my mentor and saxophone legend Lee Konitz. He talked about true spontaneity when playing with others. It's a frame of mind one has to be in along with an openness and willingness to experience the moment. While teaching past workshops it's been exciting to see student combos evolve (and very quickly too!) There have been times I've watched a combo play a song and then after throwing them some new ideas and techniques I watch them play the same song in a completely different light. It's great to see the students walk away buzzing with excitement and new ideas. We'll also go through improvisation techniques for one to practice alone in their everyday practice schedule. By practicing these concepts a little everyday your improvisations will get stronger. Just like a visual artist it's important for us to have our toolbox. We want to expand our palate, have more choices so we can ultimately feel FREE when we're doing the actual music making. WS-4 - Saxophone techniques The saxophone since the age of 10 has fascinated me, which is when I first picked it up. It continues to fascinate me every day and the possibilities are endless. In this workshop I will be talking about techniques I use on the saxophone. I'll also be talking about "finding your personal sound, bringing out the versatility of the instrument, and influences of mine. The workshop will be formatted to the level in the room. WS-5 - What is jazz? In this workshop I'll be talking about my story and how I got to where I am now. I feel like I've been breathing and playing music ever since I could talk. I started singing when I could talk, classical piano lessons at 6, wrote my first song at 7, saxophone at 10 and performing/recording professionally since the age of 12. In the past I've structured this workshop so there's lots of playing in between talking and plenty of room for conversation. If the workshop is geared towards beginners I like to talk about jazz, what improvisation is, and why as a young person I have found a fascination for studying this genre. If we have more intermediate advanced students in the workshop I like to get more in depth about my musical inspirations, techniques, how I go about practicing and addressing any specific music questions students have. All About Jazz musician pages are maintained by musicians, publicists and trusted members like you. Interested? Tell us why you would like to improve the Grace Kelly musician page.